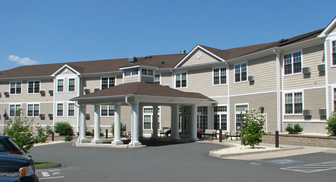 The Seymour Housing Authority manages Smithfield Gardens Assisted Living, an elderly assisted living community in Seymour located on Smith Street. Smithfield Gardens provides a special combination of housing, supportive services, personalized assistance, and health care designed to respond to the specific needs of individuals who require help with activities of daily living. To qualify for the assisted living community, you must be at least age 65 and require assistance with at least one activity of daily living (i.e. medication management, showering, meal preparation). Your total household annual income must fall within the range shown in the chart below, and your total assets cannot exceed the asset maximum. To apply for the assisted living program, download the application packet here. If you are unable to print out the application packet, please complete the application request form on our “Contact Us” page, and we will gladly mail one to you. © Seymour Housing Authority. All rights reserved. Design by Jagos Web Design.